Feed The Children is a non-profit relief organization established in 1979 and is headquartered in Oklahoma City. It exists to end child hunger and their mission is to "provide hope and resources for those without life's essentials." Feed the Children is one of the largest U.S.-based charities and serves those in need globally in 10 other countries around the world. Question: Feed the Children's website talks about "Starving for Healthy Food" - can you expand on this? Wendy Henderson: Children need nutritious food that helps them grow healthy and strong. And the younger they can get that good, healthy food, the better. Malnutrition looks different than you would expect. Most of us think of bloated bellies or severely skinny, but the appearance of a hungry child here in America might surprise you. Hunger may look like an overweight 7-year-old boy. He fills his tummy with empty calories, but receives no nutrients. He struggles with asthma and is headed for juvenile diabetes. Despite his weight, his body is hungry for nourishing food. This is just one story, in the staggering history of malnutrition and hunger here in the U.S.
What is your organization doing to help put an end to food deserts (areas in which it is difficult to buy affordable or good-quality fresh food)? Currently, we focus on high-poverty communities. For example, we have a Summer Food and Education Program in areas where 50% of the student population is enrolled in the National School Lunch Program that provides free or reduced-price meals. Many of these children do not have a stable source of nutrition during the summer months when school breakfasts and lunches are not provided. Last summer, we fed 1000+ children each day through this program. Feed the Children’s Summer Food and Education Program not only provides nourishing meals, but also feeds children’s minds. Knowing that education can break the poverty cycle, we provide free books at each site. By the end of last summer, more than 16,000 books were distributed. Children in the program also received school supplies and backpacks. Additionally, feeding sites received sports equipment to engage children in healthy sports and recreational activities. There is a stigma that organic, healthy, whole foods are only available to the privileged and wealthy. What are you doing to break that perception and get good food to all? At Feed the Children, we know hunger can’t be defeated alone. We partner with socially conscious and responsible organizations that generously give nutrient-dense food items to families we serve around the world. Additionally, some families are being introduced to whole foods for the very first time, so we offer recipes and cooking instruction cards from some of our partner brands. We strive to help educate the community and our partners of what it looks like to be hungry and how, together, we can make a difference. 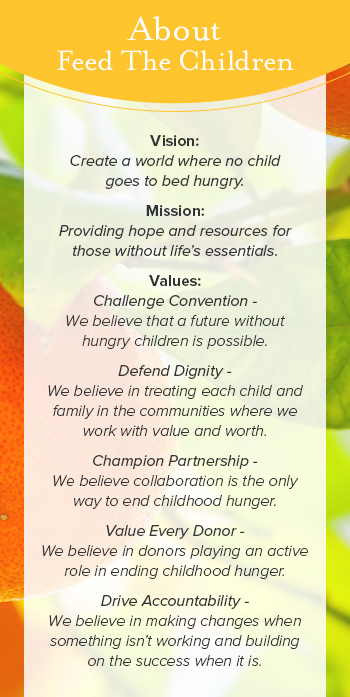 What is your specific role at Feed the Children, and how does it serve the higher goals? I am fortunate to work to educate manufacturers and corporations about what hunger looks like, as well as that it exists in their own backyard. So many companies have surplus products that will end up in landfills or sold for pennies on the dollar. Once these companies understand hunger is a real issue, right here in the land of plenty and around the world, they want to know how they can help. They join us in our mission and adopt our vision. Being a part of this process is my reward. I’m grateful to play a part in improving the lives of children in need here in the U.S. and around the world. What is the easiest thing people can do to help? What is the most effective? There are many ways to get involved. One of the easiest things to do is to donate from your mobile device at www.feedthechildren.org/act. Every generous deed is effective. Follow us on social media and share our posts. Get a group together to serve those in need or create your own fundraiser. Sponsor a child or sponsor a truckload of food. Become an advocate for children in need around the world or check out our gift catalog to see all the ways you can change a child’s life.